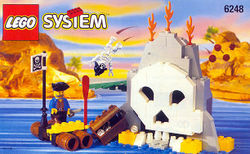 6248 Pirates Volcano Island is a set released in 1996 as a part of the Pirates theme. The set featured 119 pieces, a Pirate, and a Conquistador Skeleton. The pirate raft in this set floats on barrels. The treasure chest included in the set features gold coins as treasure. The big skull opens to reveal a treasure chest. On the back of the island, there is a spring mechanism which launches the Skeleton and bits of 'lava' when released. Facts about "6248 Volcano Island"
This page was last edited on 29 April 2016, at 12:35.